The chasing, engraving, or precious stones of the Boucheron bracelets express the creativity that drives the Maison since the very beginning. When fastened around the wrists of daring and strong women, they break all the codes of classicism. 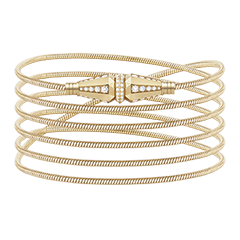 Serpent Bohème Bangle Bracelet Bangle paved with diamonds, in yellow gold. The Vendôme Chromatique bracelet is paved with yellow sapphires, agates, and mother-of-pearl. 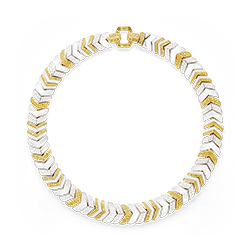 Its Art Deco lines reinterpret the chevron motif, a Parisian element par excellence. 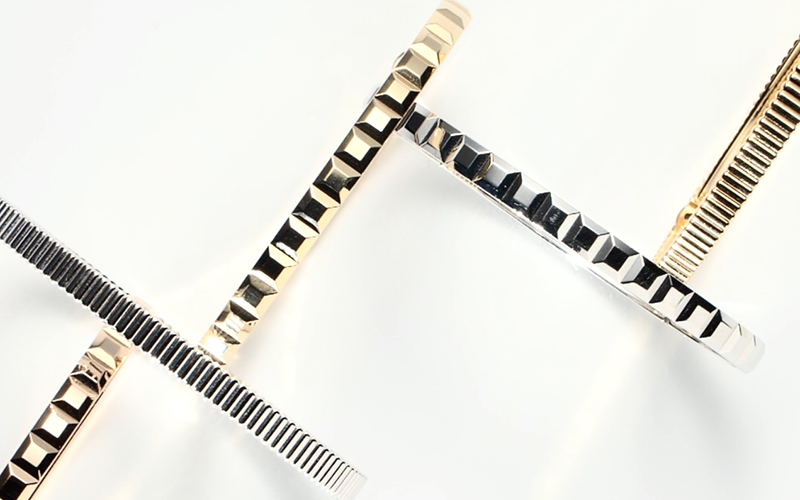 The Ava bracelet is a celebration of simplicity and delicacy combined with the jeweler's outstanding craftsmanship. 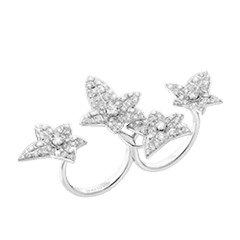 Its airy lightness makes the stone look as if it is levitating, carried by a crown of finely cut diamonds. Goutte Bracelet Bracelet set with rock crystal and paved with diamonds, in white gold. Inspired by the octagonal shape of Place Vendôme, this yellow gold bracelet enhanced by a diamond edging celebrates the re-opening of the Maison Boucheron's historic premises in 2018. The 26 copies of this limited edition are engraved from 1 to 26, like a secret one keeps to oneself, and which links the creation forever to the re-opening of this special place. This Vendôme bracelet is inspired by the octagonal shape of the famous Parisian square dear to Boucheron. This limited edition of 26 copies celebrates the re-opening of 26 Place Vendôme, the Maison Boucheron's historic premises. 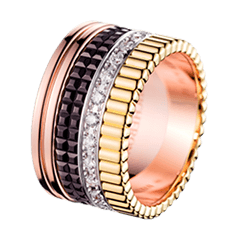 Entirely paved with diamonds on white gold, the creation is enhanced by a black laquer edging. Like a secret one keeps to oneself, each copy is engraved from 1 to 26, so it will be forever linked to the re-opening of this special place. 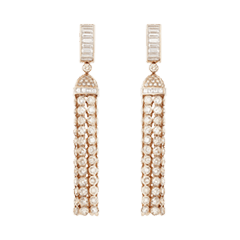 Naturally the Maison Boucheron has chosen to celebrate the re-opening of its historic premises, 26 Place Vendôme, by designing some new jewelry. 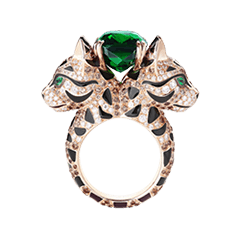 On this occasion, the Maison has created a unique design, inspired by the 'emerald cut' of the famous Parisian square. This white gold High Jewelry bracelet is entirely paved with baguette diamonds and now hallmark Boucheron. Like a secret one keeps to oneself, this creation engraved 1/1 will be forever linked to the re-opening of this special place. The secret of the white gold, diamond-paved Rivière Vendôme bracelet lies in its rock crystal, emerald-cut clasp. The engraved column in its center is a subtle reminder of the Place Vendôme, where the Maison Boucheron's historical boutique is located. The Maison Boucheron reinvented the Serpent Bohème bracelet with finesse, giving it an even more feminine air. 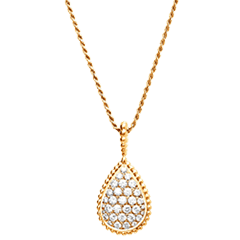 Its fine yellow gold chain enhances the diamond-set drop shape that symbolizes the serpent’s head. Boucheron reinvents the Serpent Bohème bracelet, from the iconic collection of the Maison. Its delicate pink gold chain features both finesse and elegance, and makes a gentle diamond-set, drop-shape wrist ornament. Boucheron reinvented the Serpent Bohème bracelet with the greatest finesse, and designed an even more delicate XS motif. The fineness of its yellow gold chain enhances the mother-of-pearl set on the drop shape symbolizing the serpent’s head. Boucheron reinvents the Serpent Bohème bracelet and entangles it in the Pompon Collection in a resolutely elegant line. The drop motif and its iconic yellow gold twisted chain come in lapis lazuli and diamonds. Two light pompons nestle in the crook of the wrist and give it an unquestionable couture touch. Boucheron reinvents the Serpent Bohème bracelet, the Maison’s iconic collection since 1968. Its dainty yellow gold chain subtly enhances the drop shape set with lapis-lazuli of this very elegant bracelet. Playful, spontaneous, and whimsical – the Jack Collection breathes a new life into jewelry, and opens a new chapter in the Maison Boucheron’s history. The golden thread and its resolutely design clasp hide a secret connection inspired by jack cables. It comes in a yellow gold one-round version. 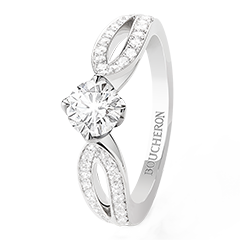 The Maison Boucheron reinvents the way we wear jewelry with its new Jack Collection. This golden, glamorous thread connects with a design clasp that hides a secret connection inspired by jack cables. This is the yellow-gold, diamond-set version. Playful, spontaneous, and whimsical – the Jack Collection reinvents the way we wear jewels, and opens a new chapter in the Maison Boucheron’s history. The golden thread and its resolutely design clasp hide a secret connection inspired by jack cables. This is the white gold one-round version. 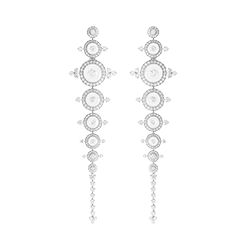 The Maison Boucheron reinvents the way we wear jewelry with its new Jack Collection. This golden, glamorous thread connects with a resolutely design clasp that hides a secret connection inspired by jack cables. This is the white gold, diamond-set one-round version. Boucheron redesigns the Serpent Bohème bracelet – an element of the Maison’s iconic collection since 1968. The fineness of its yellow gold chain enhances the turquoise stone that adorns the drop motif, a genuine reflection of the serpent’s head.